My son here in Maryland got me started playing disc golf a number of years ago and I'm so glad he did. 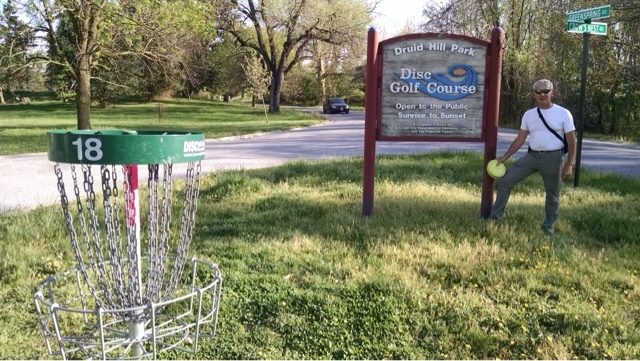 It not only brings me enjoyment playing at disc golf courses around the country and keeps me physically active, it's also something we can and do together. Today was another wonderfully warm day in Baltimore and my son had some errands there, so we spent the late afternoon and evening together in Baltimore. 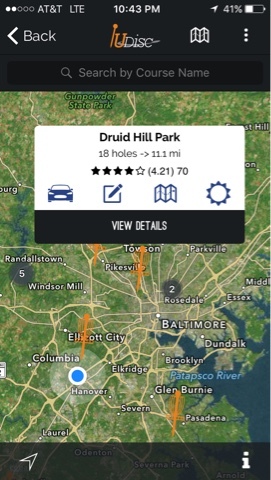 We first headed to Druid Hill Park to play 18 holes. One of my son's friends who lives nearby came and played 10 holes with us. This year's travels have provided me the opportunity to become more consistent with my game and do a lot of experimenting so now I can curve the same disc to the right and left based on how I throw it. This is very helpful with any course. I also have a disc that I have figured out to fly it mostly straight. I am no way a great player but I can hold my own with the average player. Having this opportunity to spend time with my son is just a wonderful thing and along with spending time with my other son on the west coast, they are the best part of my travels. Thanks for coming. I had a lot of fun getting to play with you.